Paulding Village was recently recognized as an original member of the Ohio Plan, a self-insurance group for municipalities. 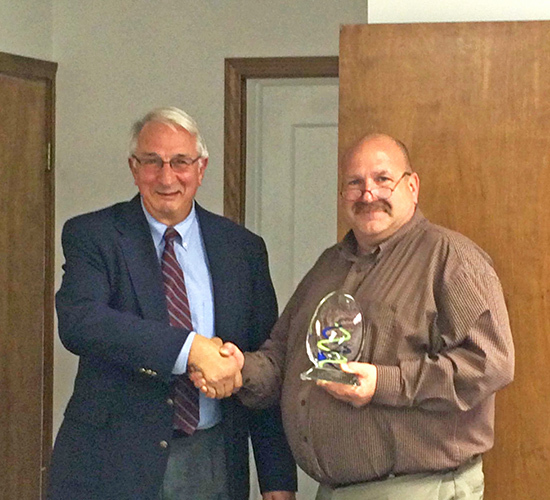 Former village administrator Harry Wiebe (left) presented the award to Mayor Greg Reinhart on Monday. PAULDING – Paulding Village Council voted to hire a village administrator and approved a $4.1 million bid for the Phase III sewer separation project during Monday’s meeting. Mayor Greg Reinhart proposed hiring Dale Goebel of Edon as village administrator at a salary of $47,840 per year. Councilman Dan Workman made the motion to hire Goebel and Greg White seconded. With no discussion, a vote proceeded with Workman, White, Barb Rife and Randy Daeger voting in favor and Dave Burtch and Tim Boss voting no. The motion passed, 4-2. Reinhart said he would contact Goebel and see if he will accept the position. The village has operated without an administrator since April 13. In an update from the Oct. 1 meeting, village solicitor Harvey Hyman reported that according to his research, the council’s hiring of a utility worker in September is valid and does not need the mayor’s approval. Reinhart had sought to void the employment, believing it was unlawful. The underlying question was who had authority in the absence of a village administrator. Hyman said the council cannot act as administrator. However, no mayoral approval was needed for the hire. Mike Karafa and Joe Hotz from Jones & Henry Engineers were present to discuss bid openings for the Phase III sewer separation project. Five companies submitted bids, ranging in total cost from $4.1 million to $5.3 million. The engineer’s estimate was $4.8 million. The low bidder was VTF Excavation of Celina, at $4,163,540.45. VTF was the contractor for Phase II of the project. Council suspended the rules and unanimously approved Resolution 1337-18 to tentatively award the contract. Before contracts are signed, the village has to complete its finance package through EPA, which possibly will happen in December. The engineers noted that 30 percent of construction costs will be funded by grants, and the remaining cost through low-interest loans. Daeger questioned whether the issue of water ponding at the northwest corner of the square will be addressed. The engineers responded that it is to be the first item addressed on the project and has to be completed within two months of the contract being signed. They noted the plan is to replace a 6-inch pipe with a 12-inch pipe between the catch basin and the sewer. There’s a risk of the brick sewer collapsing, however. Council also questioned the dips in pavement on North Williams Street, especially one a half-block north of the square. Fiscal Officer Annette Hasch noted the paving company is set to look at the problem this week. The engineers said the dip may require a temporary fix now, then a more permanent repair may be considered during the Phase IIII paving program. Council also unanimously approved a scope of service amendment with Jones & Henry for Phase III for an additional $375,000. In addition, an agreement with Jones & Henry was approved for services to abandon the existing lime sludge lagoon at the water treatment plant at Reservoir Park, for a fee of $4,340. Council also approved a Jones & Henry proposal for developing an asset management program for the village’s drinking water system, as required by EPA. The engineering cost for Phase I of the project is $12,000. Paulding County EMA director Ed Bohn told council the county’s pre-disaster mitigation plan has been completed and approved by the county. The plan now needs to be approved by each incorporated village in order to qualify for FEMA funding for preventative projects. Bohn would like for a council vote before the end of the year. Bohn also requested using village right-of-way on East Jackson Street for a “Candy Cane Lane” sign project during the Paulding Chamber’s upcoming Merry & Bright event. He was asked to complete a permit application before the next council meeting. Former village administrator Harry Wiebe was present to make a presentation. He said the Ohio Plan, which is a self-insurance plan, is celebrating its 30th anniversary this year. During a recent meeting, four communities were recognized for long membership, including Paulding. The village was one of the original members in 1988. The Ohio Plan now has 800 members and provides property and casualty coverage for the village. Wiebe presented Paulding’s recognition award to the mayor. Mike and Karen Sunday requested an update on the Emerald Acres drainage project. Council responded the priority now is ground restoration before cold weather. Rife presented bids for brush pile grinding. Council unanimously voted to approve Go Green’s bid of $4,495. Some discussion was held about possibly restricting who should be allowed to dump yard waste and tree limbs, as some people take advantage of the service. The question was referred to the building and grounds committee. • Burtch invited council members to a CoRP meeting at 6:30 p.m. Nov. 13 in the basement of the Branch Church. The guest speaker is from Heritage Ohio. • The October police report included 270 service requests, seven traffic accidents, five traffic citations written into Mayor’s Court, two citations written into County Court, 13 parking tickets written, 753 security checks completed and 16 junk notice letters sent. • The October statement of parking fines totaled $200. • In October, Mayor’s Court collected a total of $1,006.